I haven't blogged here in forever. But that's okay because I'm making up for it with the best meatball recipe ever. Well, one of the best. Ideal would be if you had an equal mix of veal, pork and beef. But the grocery down my street doesn't sell veal or pork and on this lazy afternoon, ain't nobody got time to Yelp a meat market. Instead, I settled on 80% lean / 20% fat ground beef, a healthy dose of freshly grated parmesan cheese and other delicious stuff. And now you get to make this big batch of amazingness too. Enjoy! 1. Make/form meatballs: In a large bowl, mix together the bread crumbs, cheese, parsley, garlic, beef, egg, salt, pepper and nutmeg until well-combined, about 2-3 minutes. Using your hands, form meatballs about 2-inches big. Arrange on a plate and set aside. 2. Spaghetti time: Cook pasta according to package instructions. Reserve 1/2 cup of the water, drain and set aside. 3. Sear the balls: Meanwhile, in a large skillet or saute pan over medium-high heat, heat olive oil. Working in batches, brown the outsides of the meatballs and transfer to a paper towel-lined plate. Each meatball should brown in about 4 minutes. (This process might take you about 15 minutes, total). 4. Deglaze like a pro: In the same, now-empty pan (it should have lots of delicious browned bits of beef stuck to the pan), deglaze with red wine over medium heat. Scrape the pan with a wooden spoon and let cook until reduced by about half, 2-3 minutes. 5. Finish making sauce: Add onions and cook until slightly softened, about 3 minutes. Stir in a pinch of salt and pepper. Stir in garlic, parsley, marinara sauce and pasta water. Return meatballs back to the pan/sauce, bring to a low boil and let simmer about 20 minutes. 6. 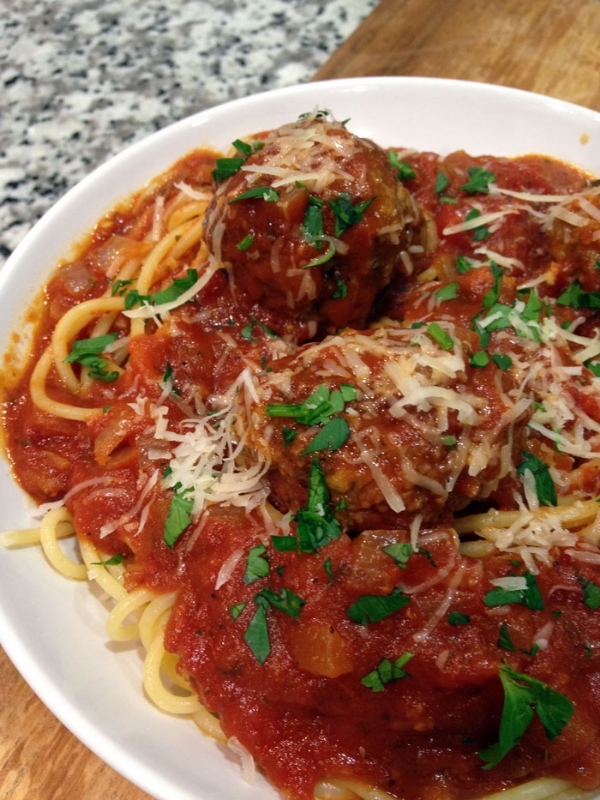 Serve: Add spaghetti to bowls, pour over sauce and give about 3 meatballs per serving. Garnish each bowl with a heavy pinch (or two!) of parmesan cheese and if you like, a little pinch of chopped parsley. Why deglaze? Because I'll find any excuse to open a bottle of wine. But really, adding the wine and scraping the pan helps you clean the browned bits off the pan. Plus, those browned bits will add some serious yumminess to your sauce. And in case you freak out from all that smoke and hissing, don't. It's part of it. Do I really have to simmer this for 20 minutes? Yes. But you might really only need 15 minutes. This is just to make sure the meatballs are cooked through.